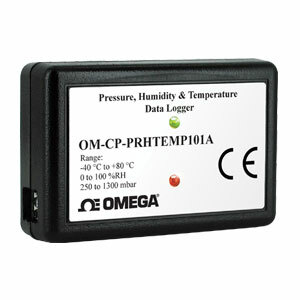 The OM-CP-PRHTEMP101A is a low cost, state-of-theart pressure, relative humidity and temperature data logger, specifically designed to be compact and portable for use in a variety of applications such as museum and archive preservation, shipping and transportation, warehouse monitoring, HVAC, clean rooms, clinical laboratories and altitude validation and studies. The OM-CP-PRHTEMP101A offers a 10-year battery life, 1 second reading rate, multiple start/stop functions, ultra-high speed download capability, optional memory wrap, battery life indicator, optional password protection, programmable high-low alarms and more. Using the software, starting, stopping and downloading from the OM-CP-PRHTEMP101A is simple and easy. Graphical, tabular and summary data is provided for analysis and data can be viewed in °C, °F, °R, K, for the temperature channel, %RH, mg/mL and dew point for the humidity channel, and mbar, PSI, inHg, mmHg, atm, Torr, Pa, m, kPa, MPa for the pressure channel. The OM-CP-PRHTEMP101A is a major leap forward in both size and performance, Its real-time clock ensures that all data is time and date stamped. The storage medium is non-volatile memory, providing maximum data security even if the battery becomes discharged. Data retrieval is simple. Simply connect the data logger to an available USB port and the easy to use Windows software does the rest. The software converts your PC into a real-time strip chart recorder. Data can be printed in tabular format and can also be exported to a text or Microsoft Excel file for further calculations. The OM-CP-PRHTEMP101A was designed with our customers in mind. There are free firmware upgrades for the life of the product so that data loggers already deployed in the field can grow with new technological developments. Units do not need to be returned to the factory for upgrades, this can be done automatically from any PC. Reading Rate: 1 reading every second up to 1 reading every 24 hours. Real Time Recording: The device may be used with a PC to monitor and record data in real time. Alarm: Programmable high and low limits; alarm is activated when recording environment reaches or exceeds set limits (pressure channel only). Password Protection: An optional password may be programmed into the device to restrict access to configuration options. Data may be read without the password. Engineering Units: Native measurement units can be changed to display measurement units of another type. Data Format: Date and time stamped °C, °F, °R, K, %RH, mg/mL, Dew Point, mbar, PSI, inHg, mmHg, atm, Torr, Pa, kPa, m, MPa units specified through software. Nota: Comes complete with 3.6V lithium battery. Operator’s manual and USB cable are included with the OM-CP-IFC200 Windows software (required to operate the data logger and sold separately).